Two massive explosions in the port of Tianjin, northern China, have killed more than a hundred people, left hundreds more injured and devastated large areas of the city. Much of what took place, or is still happening now, is unclear - but here is what we do know. How did the blasts happen? They took place at a warehouse at the port which contained hazardous and flammable chemicals, including calcium carbide, sodium cyanide, potassium nitrate, ammonium nitrate and sodium nitrate. Officials insist it is not yet clear what triggered the blasts and say they are still investigating. Chinese media said that at least one member of staff from Tianjin Dongjiang Port Ruihai International Logistics, which owns the warehouse, has been arrested. Before the explosions, several firefighters were already at the scene trying to control a blaze. There have been suggestions that water sprayed on some of the chemicals could have led to the blasts. Calcium carbide, known to be at the site, reacts with water to create the highly explosive acetylene. Chemical experts suggest an acetylene blast could then have detonated the other chemicals for a much larger blast. How big were the explosions? The China Earthquake Networks Centre said the initial explosion, in a city with a population of around 15 million, had a power equivalent to three tonnes of TNT detonating, while the second was the equivalent of 21 tonnes. The second was so big that satellites orbiting Earth picked it up as well. Chinese data site Cnbeta published pictures showing the sudden flare. How bad is the devastation? 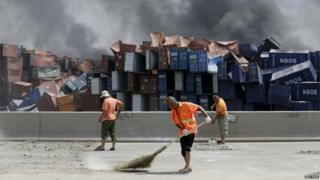 The explosion destroyed a significant amount of goods stored at and around the port, in the Binhai New District. Large shipping containers were tossed into the air like matchsticks and were crumpled by the blasts. A logistics park containing several thousand cars was incinerated by the fireball. Renault says some 1,500 of its cars were lost, while Hyundai said it had around 4,000 cars on the site - although it has not yet assessed the level of damage. The blast wave rippled out several kilometres from the port into residential areas. The impact rocked entire buildings, shattered windows and tore doors off their hinges. More than 720 people were taken to hospital, of whom nearly 60 are either critically or seriously injured. Reuters reports that several thousand people living near the port have had to leave their homes, and are now staying in local schools. How are the blasts being dealt with? More than 1,000 firefighters were dispatched to the scene to contain the fires. On Monday, authorities said they were putting out one last area that was still burning, and the last of the toxic chemicals would be neutralised and disposed of by the end of the day. More than 200 chemical and biological experts from the military were on site earlier. President Xi Jinping and Premier Li Keqiang have vowed to hold a thorough investigation and ensure "open and transparent information disclosure to the public". China has also ordered a nationwide check on dangerous chemicals and explosives. About 700 tonnes of sodium cyanide was present at the site. It is soluble in water and, when dissolved or burned, it releases the highly poisonous gas hydrogen cyanide. Authorities on Monday confirmed that three waste water discharge monitoring stations within the evacuated area saw excessive levels of cyanide, with one station recording a level 27.4 times the normal limit, reported People's Daily. But authorities have insisted that the pollutants are contained and not at risk of spreading beyond the evacuated area. What impact will this have on Tianjin port? Tianjin is a significant industrial port near Beijing, and is a gateway for goods going in and out of the capital and China's industrial north. It is also a main trading hub for metals and steel. The port remains partially open as the explosion was contained in one section. But authorities have imposed stringent checks and movement in and out of the port has slowed down, which is likely to affect some industries, the Mysteel.com news portal reported. Mining giant BHP Billiton saw some disruption to its port operations and shipments. On Monday, carmaker Toyota said it was closing production lines at its factories near Tianjin until the end of Wednesday, while agricultural machinery maker John Deere said it suspended work indefinitely. Both saw some of their workers injured by the blasts.